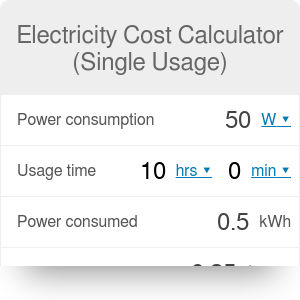 Electricity cost - single usage estimates the cost of electricity needed to run a device for a particular period of time. This calculator tells you how much it costs to run an electric device for a certain amount of time. It's often the topic of conversation and most of the time we have no clue how much it really costs to run our electric appliances. For example, you might be wondering how much it costs to boil a water in an electric kettle. Say we want to boil 2 liters (a little more than 7 cups) in a 2000 Watt kettle. You know it takes it 6 minutes to do it. The calculator tells you it would consume 0.2 kWh of energy. With an average price of $0.13 per kWh, we arrive at a 2.6 cents per single run. If you're interested in a recurring usage of utilities, try the electricity cost calculator. A hypothetical example: you use your 700 Watt vacuum cleaner twice per week for half an hour each time. So it's an hour per week. It's 700 Wh (0.7 kWh) per week, or 36.525 kWh per year. With the same $.13 per kWh price of electricity, your hoover costs you $4.75 per year. If you're interested in saving money, try our percent off calculator. .
Electricity Cost Calculator (Single Usage) can be embedded on your website to enrich the content you wrote and make it easier for your visitors to understand your message.